Faced with the major demand for cheap and clean energy, Han Group has been engaged in research on Mesoscopic Photovoltaic & Optoelectronic Devices (MPOD) since its establishment in 2008. 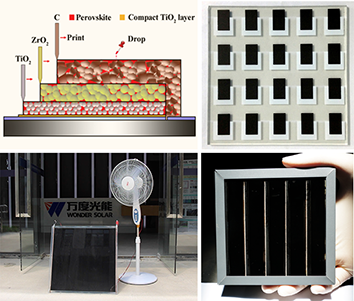 Through the innovation of materials, structure, process and mechanism, Han Group has gradually obtained the research features and the technology system of Printable Mesoscopic Solar Cells (P-MSC) based on fully printing technique and triple mesoscopic layers, which is characterized in that the nanocrystalline layer, the spacer layer and the electrode layer are printed on a single conductive substrate layer-by-layer, and then sensitized with dye and filled with electrolyte, or filled with perovskite materials directly. Relying on Mesoscopic Optoelectronics and focusing on triple-layer mesoscopic structure, Mesoscopic Photovoltaic & Optoelectronic Devices (MPOD) will be developed in Han Group. Single junction photovoltaics are explored to break the Shockley-Queisser Limit. From Fundamental Research to Industrialization Development, the whole industrial chain layout is integrated to promote low-cost photovoltaic power generation, and other optoelectronic deviecs with high perforomances.